Pablo, Tyrone, Uniqua, Tasha and Austin are five colorful animal pals with big imaginations. 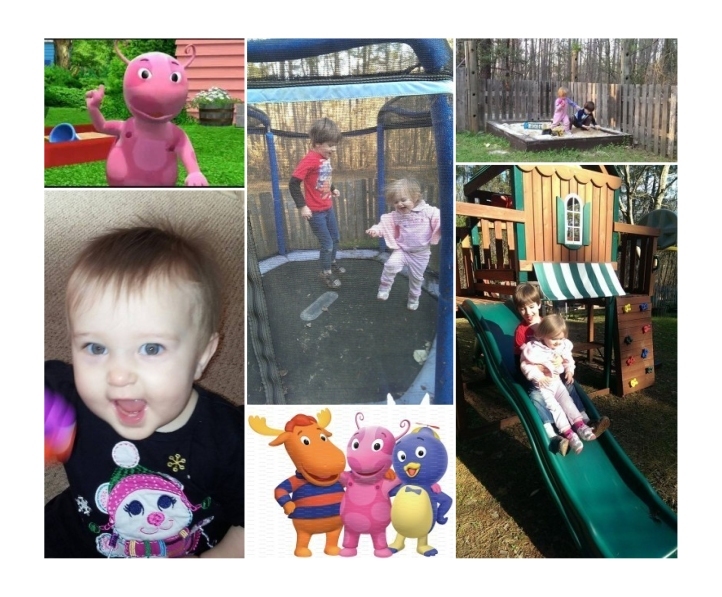 They team up to journey to imaginary places in their backyard. The TV show, and Uniqua especially, is one of my 3 year-old granddaughter Katy’s favorite things to watch on TV! Today, Uniqua and her friends have come to visit Katy, her brother Liam, and her sister Evie to play in their backyard with them! Let’s pretend we are sailing on Falls Lake down there where your Dad is a State Park Ranger, here in North Carolina! We’ll build a boat out of these cardboard boxes. Liam will be the Captain, and Uniqua will be his first mate! Katy, Evie, Pablo, and Tyrone will be sailors! “Aye Captain Liam, tell us how to begin.” Liam had everyone dragging boxes and tape over into the middle of the yard. Cool, they go together like this, now all aboard! We’re going treasure hunting! “Yea” they all cheered!” Their colorful pails soon began to fill with the shovels of sand from the island sandbox! Within seconds, they had found gold coins! Gold coins, right here in our sandbox, as Evie dug up another one buried over in her corner, than Pablo had one, Liam, Katy and Uniqua, even Tyrone! We came to the right place all right! “It’s time to sail home and show Mom our treasure, and maybe get some milk and cookies”, said Captain Liam. Again, his sailors cheered! They climbed back into their boat, picked up their oars, and away they sailed–across the lake to the deck/dock! Tieing up the boat so that it wouldn’t float away, they climbed the stairs, hot and thirsty from their trip, so relieved to be met by Mom with a plate full of cookies and a pitcher of cold milk! The sailors could hardly wait to show Mom and Ranger Greg Dad their treasure! What an adventure! Categories: A - Z Blog Challenge by the 10 Minute Novelist | Tags: A - Z Blog Challenge, Backyardigans, build a boat, Uniqua | Permalink. Ha. 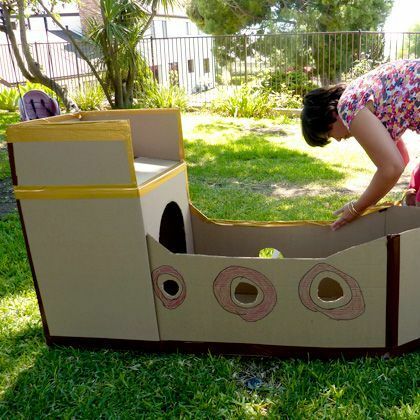 We make play things out of boxes too, but not for children, for our cats. Boxes, boxes, boxes!